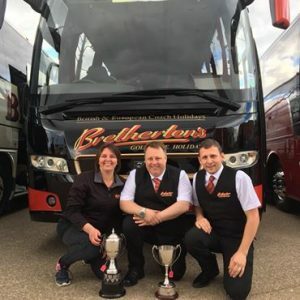 We are delighted that as a result of the endeavors of our hard working staff, and the continued support of our fabulous customers we can announce that we won Best Volvo and Concours D’elegence Awards at this years Blackpool Coach Rally! Also a Massive well done to JP for reaching the finals for coach driver of the year . These great achievements, and the joy of working amongst such a great team, and friendly customers makes it all worthwhile. Thank you all so much for your efforts.